Are you looking for a quick and easy way to make boiled cabbage that tastes like the dish grandma used to make? Our Instant Pot Cabbage is the electric pressure cooker version of our family recipe for an amazing side dish that happens to be low carb too! Place all ingredients into a 6 quart electric pressure cooker. Set lid to seal and cook under high pressure for 5-10 minutes depending on tenderness desired. Quick release and serve with a slotted spoon. We love melt in your mouth cabbage, if you would like your cabbage to have a firmer texture, set your Instant Pot for 5 minutes, not 10 minutes. This is an Electric Pressure Cooker Recipe (Here are all our EP Recipes.) 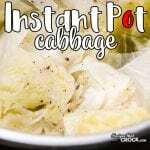 If you are looking for a crock pot recipe for cabbage, here is our Crock Pot Cabbage. We have made this cabbage successfully in all of our 6 quart electric pressure cookers: Instant Pot, Crock Pot Express and Farberware.